Although my daughters are often quite good at remembering to say thank you, they do sometimes forget and I find myself having to remind them. This is one reason I was pleased that they selected ‘Harvey Hare Postman Extraordinaire’ during our recent library visit as it really does have a strong message about appreciating what people do and remembering to say thank you! ‘day after day, all year long, he carried the heavy mailbag far and wide, across the fields, up the hill and down the other side, delivering the mail to all the animals’. So right at the start the reader can see just how busy Harvey is and how difficult his job must be. The ensuing pages go on to illustrate exactly this as we follow Harvey over the course of a year and through all the different seasons. There are times when he delivers the letters and parcels in quite extreme weather conditions too. Sometimes it is exceptionally hot; sometimes very windy; and occasionally there are snowy blizzards. Whatever the weather though, Harvey always delivers the mail! There are also some brilliant illustrations that accompany all these different conditions showing Harvey hare becoming more and more dishevelled along the way! All of the other woodland animals do start to appreciate how hard Harvey works though and they decide that they really should do something to say thank you. Therefore, they scurry through the woodlands to find leaves, twigs, flowers and grasses to use in order to make the one thing that will help Harvey in all weather conditions – an umbrella! At the end of the story you see Harvey Hare making good use of this great gift and feeling particularly lucky to have such appreciative friends. 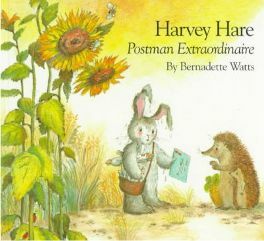 Overall ‘Harvey Hare Postman Extraordinaire’ is a lovely short story with a great message. It is good to read about characters being so appreciative and actually thinking about what they can do in return. The illustrations that go along side the story are fabulous and really show just how poor Harvey is feeling at times. My five year old daughter is particularly fascinated by Harvey’s ears which are very upright and proud but gradually they droop more and more as the weather worsens and as he gets more tired. The pictures are quite bright and colourful and there is much detail tom support the telling of the story. Although this is essentially a picture book, there is a bit more text on most pages than you would expect to find in many picture books. This makes it quite suitable for children who are just gaining confidence in reading as there are enough words on the page without there being too many, and most of the words are quite accessible. My six year old daughter loves reading it to her younger sister. ‘Harvey Hare Postman Extraordinaire’ is a great story for small children and both my daughters definitely recommend it and I do too. No Comments on "Harvey Hare Postman Extraordinaire"